Individual company risk is reduced. (If one out of 2 dozen stocks has a “perp walk” of the CFO the impact on the basket is much less. If the ETF manager is any good, they will have avoided that kind of stock anyway, or gotten out at the first whiff of bad news.) Sector risk is usually reduced, unless you chose a sector fund, so an ETF of broad type will have some of several sectors represented. If Sovereign Risk dumps a new tax on Mining, the impact will be reduced on the basket as the variety of non-mining stocks mute the impact. So, all in all, ETFs are an easy way to get a broadly diversified “basket” and put some of the workload of managing it on someone else. I will often use the iShares Index funds if I have not more specific theme. These invest in instruments to duplicate the movement of some index or other in each country. Generally a broader ‘mix’ in the basket and with good tracking of the index. OK, so what do we see on this graph? First off, it’s a bit ‘busy’ with 10 “tickers” on it. So you could run them in ‘pairs’ on your own graph at Bigcharts to get a clearer view. For now, click on the graph to make it bigger for easier reading (Mac users can hold down “control” while clicking on it and choose ‘open in new window’). Notice, first, that bright blue benchmark line of SPY. Most of the other lines are below it. This is a “risk off” world right now, and folks pull money from the places they think are ‘more risky’ first. Rightly or wrongly, the USA is still thought of as ‘less risky’; so we see much of the emerging markets dropping faster than the USA. 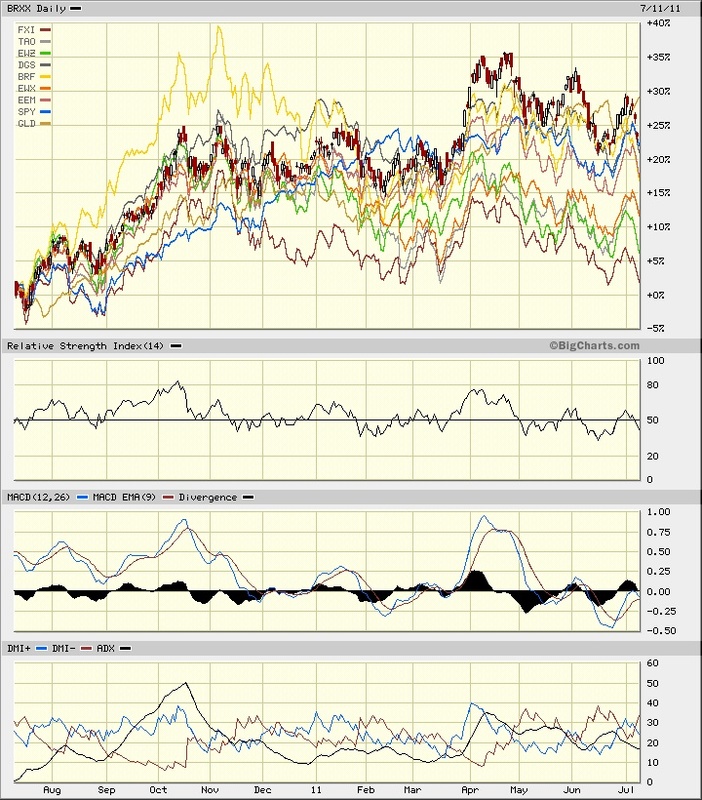 At the very far right edge, we see that gold colored GLD line at the top. Folks run to gold when scared. In “good times” and in a “risk on” world; that order inverts. OK, next up, notice that dark DGS line and the bright yellow BRF line. Both hold up very well compared to all the rest. More volatile than the SPY but about the same overall performance. (BRF in particular could be a good trade vehicle as it really shoots up in good times, but watch out for those sickening plunges if you time the entry wrong…) What are these? BRF is a small cap Brazil fund. Not driven as much by large institutional traders and investors. Better growth in small firms just starting out (when compared to things like the large telcos or electric utilities in the larger cap funds). That is what you frequently run into when looking “inside” small and / or foreign funds. Something that does not speak to you. That’s why I often will depend on the reputation of the fund manager. Sometimes I’ll “dig in” to particular tickers, looking for what’s interesting or questionable. Looking for “ideas”. In a way, less helpful, but in another way, very much help. Notice that the “top 10” holdings are only 15% of total assets? No one position over 2%. A VERY broad diversification. That’s good. Harder to find ‘what is best in what they hold’, but far less likely that one stinker will sink the fund. “Ford” is a name I know. So they are sticking with experienced companies, at least for some of the larger holdings, with dividends. “Unipetrol” I’ve heard of before, but I don’t remember the details (a minor ‘dig here’? to refresh?) and then we have that some of the global exposure comes from funds that are themselves diversified baskets “India Earnings”. So I could, IFF I wished, do a ‘India Earnings’ vis DGS race and see if India was better, or worse. Or I can just admire that I’m getting a broad exposure to India in one tiny slice of this fund. All in all, looking well diversified with detailed management. PE of about 10 is nice value investing. Price to Book under 2 is good too (“deep value” starting at about 1:1 price book, so this is ‘modest value’). Nice low price/sales and decent price to cashflow. OK, what’s left? EEM and EWX. A broad “emerging markets index” and a small cap emerging markets. EWX is just above the green EWZ Brazil line. Probably has some China in it pulling it down. EEM is doing better. Above the SPY until Nov then turns into a ‘flat roller’ and ends slightly below the SPY. The big bet on Taiwan and using Futures contracts to do it makes me worried. Leveraged bets can be very risky… All in all, not seeing a reason to “embrace” this fund. Vanguard is the fund manager, and historically they were a value and detailed oriented company, but the “look of things” at a first glance is not encouraging. On the other hand, that it has held up so well while both Brazil and China funds have sunk under it, implies the managers did a better job than just sitting in a broad mix of Brazil and China and watching it sink. This is an example of taking an “idea” (a single ticker advert or story on a financial show) and turning it into a “sector race”; then digging inside a bit for some insight on making a choice. All up, it takes about a half hour. (A lot less time than making this ‘write up’). Then comes the hard part: Making a decision about the future. Will the past be prologue? I’d put DGS at the top of my “interesting to watch” list from this study along with BRXX. BRF just behind them. Even just camping out in gold has some charm. China and EWZ “Broad Big Brazil” go onto a “bottoming watch list” for a turn around and Brazil in general gets a “watch for political change of climate” flag. Overall, the rise at the start of the chart shows how the Emerging Market stocks can out perform in a ‘risk on’ market, even while the time since December shows how fast they can drop in a ‘risk off’ world. This entry was posted in Emergency Preparation and Risks and tagged Stock Trading, trading. Bookmark the permalink. I dunno, Chiefio. With the Euro troubles spreading to Italy, perhaps, and the attitudes of the folks in Washington hardening, its cash on the sidelines for (Big Chicken) me. There is a presumption that, since all crisis are averted at the eleventh hour, these will be too. Here’s why I don’t think so. Usually these things do resolve. Failure occurs when one side is insane, or faces an existantial issue. I see europe stumbling through, and arguing with the ratings folks about whether or not a “real’ default has occurred. But domestically, one side does face an existential issue. If Democrats don’t win, they don’t eat. REAL ( and persistant) cuts only happen when the headcount is cut, and that means Democrats losing jobs. Whether direct government employment (10% plus of us) or direct based on grants, etc. (another n% – hard to find a non-squishy number), or Davis-Bacon Employment in infrastructure, when there are real cuts in government Democrats have their rice-bowl attacked. Those that believe the economy is a zero sum game also believe that Rebublican Millionaires are also thereby enriched. It often remarked that the left will fail when it runs out of other peoples money. It is something of a myth, I think, that most of this money is spent to benefit “the poor” or other third parties. Most of the money is spent to hire folks to manage other folks lives, generally with pretty good wage and benefit packages. There is a dandy feedback loop where a lot of this cash flow goes directly back into the system to elect more folks who will hire more folks etc etc. See the teacher’s union. This is not a value judgement; they are behaving just like Adam Smith said they would as an economic player. One can’t blame these folks for seeking to better themselves (though it is a bit disengnuous that they stridently preach that such conduct in business is evil incarnate). But since the dealing in Washington threatens their very livelyhood, the risk that they will eschew compromise increases. Now, I know that, with a high probibility, “this time is different” is one of the dumbest things a person can say. But I still think hunkering down until the fireworks are over, and maybe until the next presidential election, is the right course for me. There are occasional times that things really are different and the crop of elected poliwogs really are pretty pathetic and doodleing all day, and calling each other names, worried about their base, and achieving absolutely nothing, if not making everything for everyone worse. Today is such a time and this time really is different! Just as markets go up and down on occassional skitters, this one is set to collapse for lack of guts to pull the plug on pathetic giveaway programs built into our House of Cards economy for the last 75 years. No one, absolutely no one, is going to do what needs to be done; they can’t. It’s beyond them. This time IS different. Well, it is, and it isn’t…. Looks like Silver may be the metal of choice this week for folks who didn’t buy Gold when it was a lot less than now. This could be “nerves”, “anticipation”, “insurance” for when the Market takes a 50% dive on some Friday the 13th or whenever. Obama is a radical socialist who’s only interested in getting is name in history books with Lenin and Mao; he doesn’t care how, the bigger the splash the better in his opinion. I think he really envies Hoover and wants to do better by far, though I think he’s giving that Old Man too much credit for something many others did. Anyway, no compromise on the budget for him with a bunch of hardline Goppers who have drawn their line in the sand. The worst of both worlds – a President who wants to change the world and a bunch of Tea Party Goppers who intend to throw the country overboard. Ain’t it great to live in a period of Historic World Upheavel with so many fools who stand for such lofty principals? I better shut up before I get opinionated. Opinions are the spice of life. It the inability to discuss them with civility that makes most of the web and many personal interactions unpleasant. Isn’t this a great blog! ?